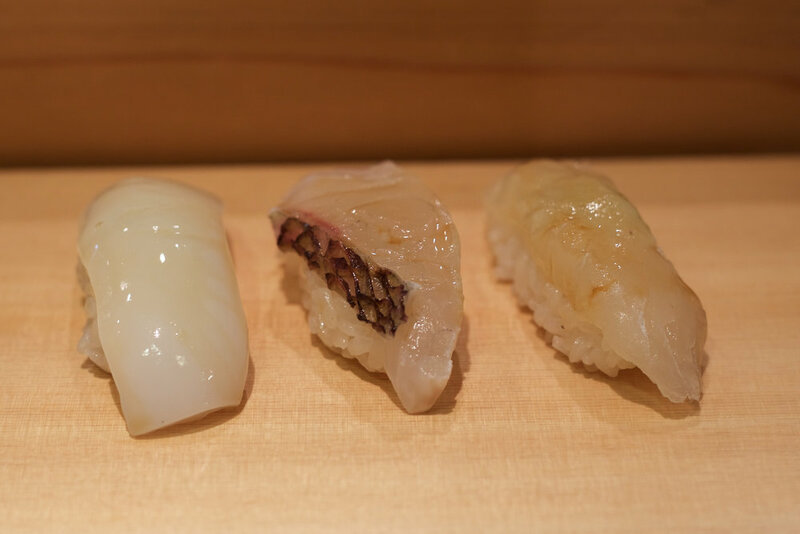 Bentenyama Miyako Zushi can trace its lineage all the way back to the beginning of Edomae sushi. The restaurant was founded in 1866 - it has been in business for 150 years! First chef Kinshichi trained with Hanaya Yohei, considered by many to be the founder of Edomae sushi. This place is the real deal... Today, 73 year old master chef Tadashi Uchida is the 5th generation Taishō, and he is assisted by 6th generation chef Daisuke Yamashita, who will one day take over as the shop's master chef. Akiko Nakagawa, chef Uchida's eldest daughter, is the 6th generation okami. 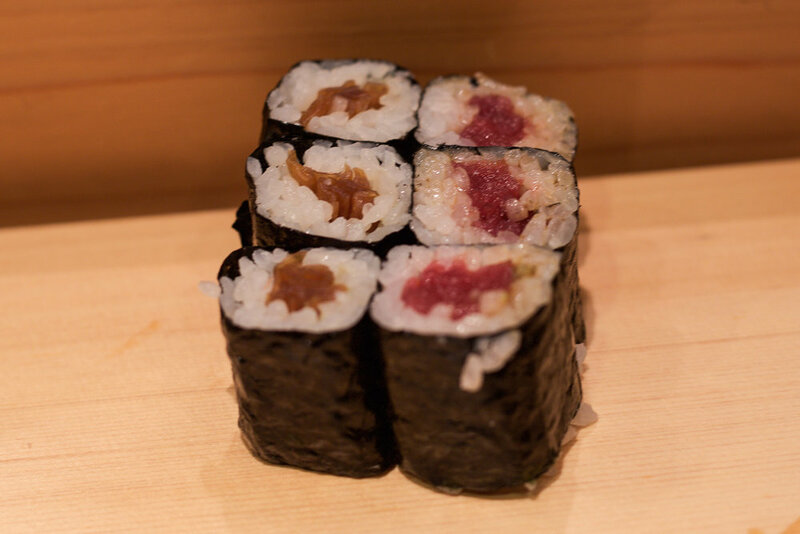 The focus at this shop is to offer delicious sushi at reasonable prices, while keeping Edomae sushi traditions alive. Chef Uchida shuns modern ingredients (such as uni or ikura) and preparation methods (no butane blow torch in sight here! ), preferring instead to adhere completely to tradition. 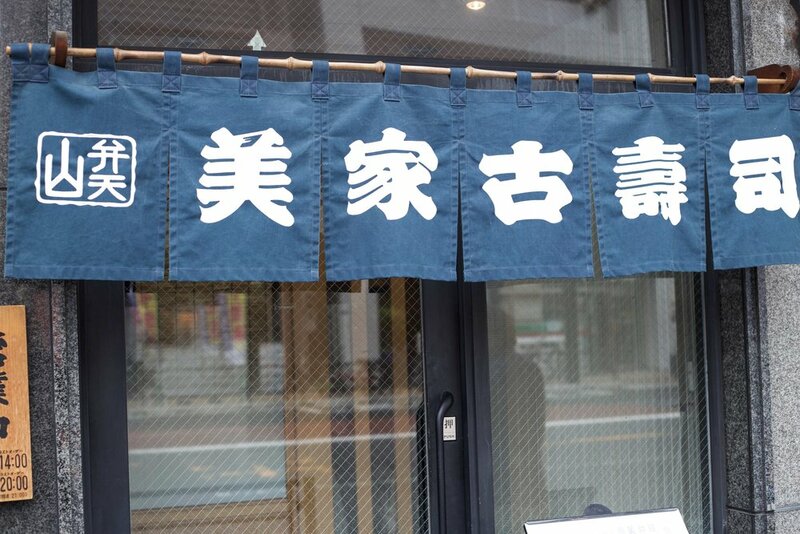 The shop was renovated a few years ago, but the food is as classic Edo as you'll find anywhere. On Friday, after my tour of Tsukiji, I headed over to Asakusa with my good friend Teppei for lunch at Bentenyama. We arrived at 11:30, right as the shop opened its doors. We sat at the bar and both ordered the Miyako set: 17 pieces of nigiri and a hosomaki for a very reasonable ¥10,250 (roughly $96 at today's exchange rate). Over the next 90 minutes, we experienced not only an incredible lunch, but also also a wonderful Edomae-zushi culinary masterclass courtesy of chef Uchida. The shop is located in Asakusa, just a few blocks from the famed Sensō-ji Buddhist temple, and also very near the Sumida river. It is on a fairly large, busy mixed commercial / residential street. Fifth generation master chef Tadashi Uchida (who prepared our sushi) is on the left, and 6th generation chef Daisuke Yamashita on the right. Our meal started with a couple of delicious tsumami (appetizers) - first we were served slices of tako that were very soft, sweet and flavorful. Next came some juicy pieces of very good anago. Chef Uchida elected to prepare 3 pieces of nigiri at a time, which worked out just fine; it allowed us to eat the pieces pretty quickly, insuring that the shari (rice) would not cool down too much. His shari is delicious: strongly seasoned with a blend of akazu and komezu vinegars and sea salt, and yet balanced and very flavorful. The pieces of sushi were quite large, with a good balance between the amount of shari used versus the size of the neta. Rice was at body temperature, with a nice shine to it. I found the rice to be nicely al dente, with each grain retaining its own distinct structure. Uchida-san didn't shy away from using plenty of freshly grated wasabi in each piece of nigiri, another trait of classic Edo sushi. Our first course of nigiri as pictured above: aori ika, kinmedia, karei. I particularly enjoyed the delicate taste of the karei. Next: early season katsuo, kanpachi, and akagai. The akagai was especially noteworthy; very sweet and toothy. 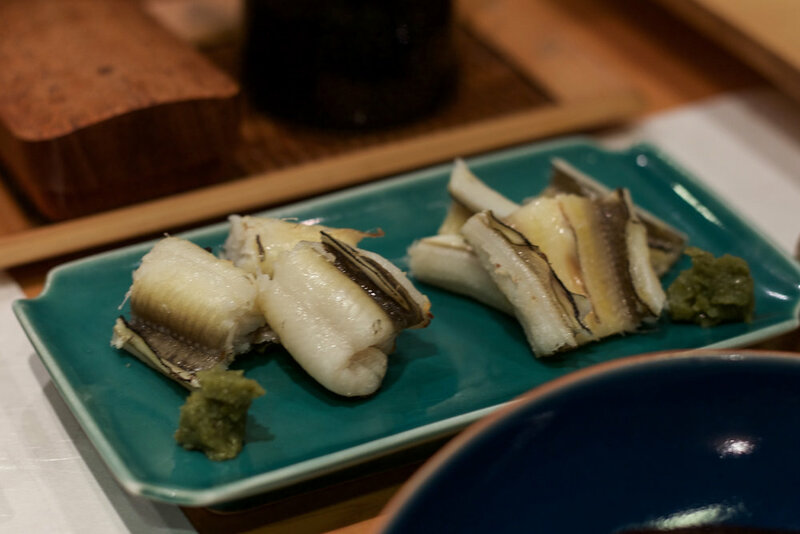 Next round included awabi, kohada, and torigai. Simply delicious! Many shellfish reach their shun during the month of May so this meal featured an impressive selection of shellfish. Closeup of the very tender awabi. Chef Uchida's nikiri sauce complemented the neta well. Next round: aji, kuruma ebi, and tairagai. Aji season had just started and this piece was impressive. The kuruma ebi was great as well, very fresh and juicy and still quite warm, with its miso and a dab of oboro placed between the ebi and the rice. Next up: two of the best pieces of the day. The ni-ika (squid simmered in a soy-flavored stock, a very traditional preparation method) was sublime! And simmered anago nigiri with a fantastic sweet tsume. Wow! For the nigiri grand finale: tamago, maguro zuke, and chu-toro. I particularly enjoyed the zuke preparation. Last course: enjoyable pieces of kanpyomaki and tekkamaki - always a classic finish. As I'm sure you have figured out by now, I greatly enjoyed my lunch at this wonderful sushiya. The chefs and staff here are serious but warm, and you can tell they care deeply about their craft. I loved being there with a Japanese friend, it allowed me to ask Chef Uchida a bunch of geeky questions about Edomae-zushi. The man is a walking encyclopedia on the subject, and he was more than happy to answer my questions with thoughtful, in-depth answers which my friend kindly translated. His passion and enthusiasm for sushi, at age 73, is simply amazing, and I think that he enjoyed having a foreign customer who was appreciative of his virtuosity and knowledge. He seemed to enjoy talking about sushi as much as I enjoyed listening to him talk! So, if you can, bring a fluent Japanese speaker with you, and don't be afraid to engage Uchida-san in conversation, it will make for an unforgettable experience.